We invite you to explore India - the Land with infinite beauty ! Whether you soar high into Himalayas or peer under the ruins of the Ancient monuments dotting the landscape of India, you will cherish the experience long after your visit ! This India Travel Guide on Nathulla Pass is free from any commercial interest! This site is dedicated to promote India - the vast subcontinent, its glorious past, magnificent landscape and its infinite variety. 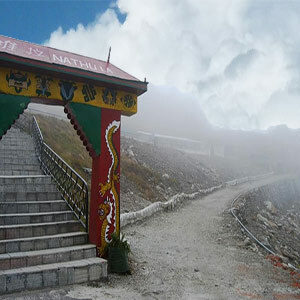 The state capital of Sikkim, Nathulla Pass, is strategically located on the China-India border. Situated 56 km east of Gangtok, the Pass connects Sikkim to Tibet Autonomous Region in China. Interestingly, Nathulla Pass connected Lhasa in Tibet to the plains of Bengal in on the ancient silk route. The Pass is located at an awesome altitude of 14,410 feet above sea level; Nathulla being one of the highest motorable roads in the world. Nathu means Listening ears and La means Pass in Tibetan. Closed for about 44 years after the Indo- China war in 1962, Nathulla opened in 2006 and now sees a huge number of visitors passing through everyday. Perhaps, it can be said that the best part about Nathulla is the travel through the Pass itself. Who can visit the Nathulla Pass? The restriction is that only Indians can pass through Nathulla on specific days - Wednesdays, Thursdays, Saturdays and Sundays. A special permit is required to visit this Pass at such a high altitude, although this permit can be arranged by a local travel agent. When is the best time to visit the Pass? The best time to visit Nathulla is from March to mid November. During winters there is the danger of snowfall blocking the way leaving the area not easily navigable. The temperature drops as low as -25 degree C in Nathulla during winters. What distinguished Nathulla from other border areas? Nathulla Pass, though a border area, does not have a 'no man's land' which is normally found in border areas. Here, a visitor can find only a barbed wire and two armies guarding either side of the land. Since Nathulla Pass along with Jelpa and Donkialal passes is the connecting route for Tibet, which is now occupied by China, and is also the only Pass exclusively used for transporting goods between China and India, China plans to connect Nathulla directly to Lhasa also. Nathulla is a trekkers' paradise. It is here that trekkers get to explore a wide range of Himalayan vegetation and wildlife. The place is also perfect for a retreat from the noisy and crowded cities. The Pass and the areas around it are calm and quiet. A travel through Nathulla is like travelling through a heavenly area - misty peaks, the zig zag roads, the roaring waterfalls amidst the shrouded hills. As one reaches Nathulla Pass, you need to leave your vehicles behind and climb the steps to reach Nathulla. For those who would like to converse with the Chinese soldiers on the borders; a few common Chinese phrases and their English translation are written on the boards nearby. Nathulla Pass has two prominent pilgrimage centres nearby. One belongs to the Buddhists and the other to the Hindus. Lhasa is the Buddhist pilgrimage near Nathulla. This is also known as Roof of the World. The Hindu pilgrimage is Mansarovar Lake which is often proclaimed as the place of spiritual freedom. A splendid blue water lake called Changu Lake can be viewed from Nathulla Pass, deep into Chinese territory. It is 2000 feet downhill. Changu Lake literally means 'source of the lake' in Bhutia language. The lake is about a kilometer long and oval in shape. It is 15 meters deep and is considered sacred by the locals. This serene lake which is situated at an altitude of 12,000 ft on the Gangtok Nathu La highway is about 40 kms from Gangtok. There is a pilgrim destination dedicated to Baba Harbhajan Singh on the Chinese side. This soldier fought and lost his life in 1962 war and it is believed that his spirit still patrols these valleys. He is revered both by Indian and Chinese soldiers. There are shops for some locally good items in Nathulla. The small shops by the Tsomgo Lake sell sweaters, shawls, scarves and thermals with a 'made in China' tag. One can enjoy a Yak Safari on the banks of the lake. As it falls within the restricted area, an inner line permit is required by Indians to visit this place. Foreign nationals are not permitted, without special permit. To visit Nathulla, you need to submit an Identity proof, and two passport size photographs. Armed forces authorities and Sikkim tourism authorities handle the permit issue. You can plan Nathulla Pass and Changu Lake in a day trip. This is a pass covered with snow throughout the year. It is better to get medical fitness before embarking on a visit to Nathulla. As oxygen decreases as one goes higher, it is better to carry necessary first aid and medicines along. Thick woolen clothes, gloves, trekking gear and eye gears like goggles are a must during travel to Nathulla. Biscuits, popcorn and snacks can be carried along to eat as shops are not available easily here. Hire a local driver who known the ins and outs of the roads on these conditions. Carry cash to buy essentials. Plan such trips in a group. The re-opening of Nathulla Pass is a significant achievement for the Government of Sikkim and the Union Government. Friendly relationship between India and China, the two emerging powers in the world, is now being promoted. This Pass is historically important as a trade and tourist attraction for Tsomgo, Sherathang, Nathulla, Kupup and Gnathang centres. During peak season, about 300 vehicles ply in these areas, as per the records of police check post. This area, as well as Gangtok has become a sort of tourist hub for road connectivity, amenities and communication facilities which are provided from this route to Tibet Autonomous Region-China.